Easily organize, plan, track and collaborate. Enhance efficiencies, increase productivity and streamline workflows. Bill4Time is used by professionals in a broad range of industries. Within those industries, the terminology differs as to what is defined as a project. If you're an accountant or consultant, you may call it a project, an engagement or assignment. If you're a legal professional, it's most likely called a matter or case. With Bill4time, you can call a "project" anything you want by easily changing the default label to suit your profession. Let's speak your language -- what do you call a project? Management feature helps you organize, plan, track and better run your entire business. Your clients and your get the same attention. Separate time and expenses, add files and notes and keep up with accounting all in one central location. Clients often delay remitting payment if they don't understand the invoice. 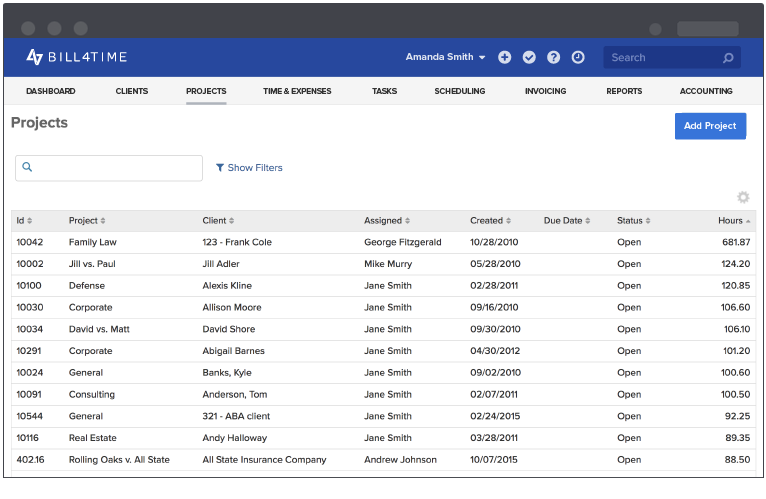 Provide details by creating and assigning activity for a Clients get the information they want and you get paid on time. Eliminate wasting time by doubling efforts. The dashboard shows time and expenses entries for each team member and the shared schedule shares future activity of all members assigned to that individual . Every has a customizable notification center. Each team member can be updated on the activity that matters most to them at the time it happens.